For our podcast on Takeshi Kitano's Hana-bi (Fireworks), click here. The mob drama is very hard to get right. Sure, it seems like there’s a lot that do: The Godfather, The Public Enemy, Little Caesar, Goodfellas, but how many have we forgotten? Nobody talks about Michael Cimino’s Year of the Dragon or The Sicilian nor does anyone mention Terence Young’s The Valachi Papers. There has been thousands of American mob movies people have never seen or heard of—and the same can be said of the mob cinema of Italy or France or China. But what makes a mob movie any good in the first place? The answer lies, I believe, in an awareness of what has come before, a foundation of knowledge, a history of what has been done, which the filmmaker recognizes and chooses to reject. It is in this regard that Takeshi Kitano’s 2010 film, Outrage, sadly fails. Released in Japan by Office Kitano and Warner Bros. in the States, the film is Kitano’s 15th and marks his return to the mob film (the yakuza more specifically) since 2001’s Brother. Though Kitano started out as a comedian, his rise as a filmmaker was propelled by bold and innovative work like Sonatine and Hana-bi (Fireworks), but Outrage does little to remind us of those masterpieces. The film, at its heart, is elliptical: Every scene is brief and muted, often ending before it has even begun. Characters exchange a few lines before a sudden cut or a fade to black changes locations. In fact, this seems to be one of the film’s biggest weaknesses when compared to Hana-bi. There are no dramatic edits, no sharp contrast between two images, like in the previous film, and it creates a monotonous rhythm to the film’s pace. Because the camera is often static but carefully placed, the scenes have a certain solemnity, which is only shattered with a violent explosion, and there’s a strange lack of cohesion to its organization and a lack of propulsion to the story. That’s not to say there is no sense of causality to the plot—there is and plenty of it—but because the editing never seems guided by some greater unifying principle, it instead feels slapdash and messy. As anyone who has ever seen a Kitano film can tell you, whether its Zatoichi or Violent Cop, the director is not known for his compelling plots, and his dialogue is more the efficient exposition of James Cameron than the thoughtful and lyrical style of a Wong Kar-Wai. Kitano relies on visual storytelling, the careful composition of an image, silence and action, but while the director still showcases his visual flair and excellent blocking, it comes as a surprise to find that Outrage has a plot—and a lot of it. The story is a complex web of double-crosses and betrayals, a series of connecting subplots which constitute a whole, but the main thrust is Otomo’s (played by Kitano under his Beat Takeshi moniker) allegiance to Ikemoto (Jun Kunimura), who uses Otomo as a pawn in order to create tension within their yakuza syndicate and seize control of rival territory, much to the dismay of the equally machiavellian syndicate chairman (Soichiro Kitamura). 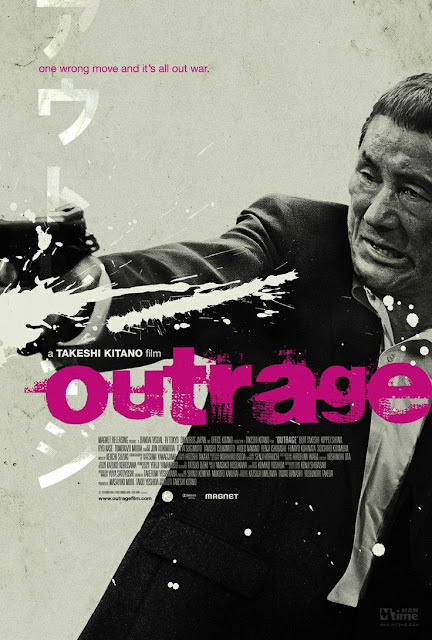 The plot is reminiscent of Shakespeare, part Othello, part King Lear, but unlike some of Kitano’s other films, Outrage seems largely uninterested in its protagonist. Sure, we get a sense of who Otomo is and understand his unbreakable loyalty to ritual and his superiors but rarely are his choice his own. For one, there isn’t much in terms of debate (when the refusal of the call comes) as the film moves from act one to act two without real pause, since Otomo is just following orders. He has no alternatives. They aren’t even presented. In other words, the plot moves forward because it has to. The only real choices he makes come late in act two, when his back is against the wall and must see the chairman himself, and near the end of the film, Otomo gives up and turns himself into the police. Much like Iago dwarfs the protagonist in Othello, the crafty secondary characters are far more interesting than Otomo. They aren’t static like he is but active: Ikemoto betrays Murase (Renji Ishibashi); Ishihara (Tomokazu Miura) skims money from the casino behind Otomo’s back; Ozawa (Tetta Sugimoto) leaves Ikemoto for dead; Kato (Tomokazu Miura) murders the chairman and takes on the position for himself. Of particular note is Ishihara, who, over the course of the movie, transforms from foot-solider to the syndicate’s number two, patiently manipulating the game behind the scenes, but unlike Portia in Merchant of Venice or Rosalind in As You Like It, Ishihara is relegated to the scenery a little too often. In fact, this is, narratively speaking, one of the film’s biggest weaknesses: the lack of focus. The film has so many characters that it doesn’t have a chance to explore any of them completely, as scenes go from one character to another, trying to keep all the different plot threads in play, but since the film is only an hour and 48 minutes, which somehow feels too long here, the movie never has gives us a full glimpse at any of the characters. Of course, it would be remiss of me if I didn’t speak to what all those machinations were in service of. At the end of the day, the yubitsume (the cutting off of one’s finger as penance) and the irezumi (full body tattoos associated with the yakuza) and the syndicate offices are all there to remind us that these men are bound by a centuries old code and its rituals, but there is no honor among thieves. It is only those who still follow the rules, the Otomos, the Murases, the Mizunos (Kippei Shiina), who end up serving someone else’s interests, and their reward is death. And this is where Outrage falters the most. The traditional versus the lawless is a theme often explored in yakuza films, like, for example, Tokyo Drifter, and comes up again and again in mob films the world over, but Outrage fails to bring anything new to the table, neither stylistically nor thematically. There’s no doubt that Kitano is aware of the genre: In some ways, he has helped redefine it. But this isn’t a film designed to push the boundaries of the form, to find those untold ideas in an age old story. And that maybe the most damning thing one could say about this film. It’s competent, yes, but after the blood is spilled and the bullets fly and the necks are snapped, it’s clear that Kitano doesn’t have anything new to say. Outrage is currently available on Netflix.